If you read my post last week, you know that the AFC is a two-horse race and the NFC is a mess. All four first-round games agreed with the True Wins predictions. I didn’t trust the Seahawks on the road, but True Wins came through (11 for the Seahawks versus just 9.5 for the Skins). So, what are we left with? Two clear favorites in the AFC (Patriots and Broncos) and two toss ups in the NFC. True Wins alone takes 49ers over Packers (11.5 to 11) and Seahawks over Falcons (11 to 10.5). I’m going to stick with the home teams in both cases, but don’t expect blowouts in the NFC unless the turnover margin is really skewed. As part of football month on the blog, here are a couple random questions and answers that I’ve accumulated. Should the NFL eliminate kickoffs? Greg Schiano, the Buccaneers crazy coach, thinks the NFL should get rid of kickoffs to protect player safety. A Rutgers player was paralyzed running kick coverage while Schiano coached there, so he knows exactly how dangerous kickoffs can be. Never mind that this is the same coach who runs a “kneel down blitz” when the other team is trying to kill the clock, a tactic that might work once when the other team is not expecting it, but will probably never work again. You may recognize the intuition from pythagorean expectations — you get full credit for blowout wins (I define this as more than 7 points), but no extra credit for winning by huge margins, and you get half credit for all close games, since those probably come down to luck more than skill. 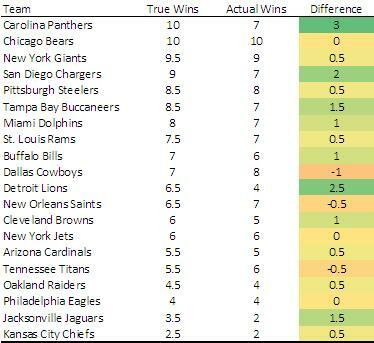 Last year, I showed that True Wins predicts a little better than pythagoreans, and it’s a whole lot more direct. Both measures are much better than using wins alone, which unfairly penalize (reward) teams that lose (win) a lot of close games. What Else is Luck-Driven? Fumble Recoveries? Stripping the ball is a skill. Holding onto the ball is a skill. Pouncing on the ball as it is bouncing all over the place is not a skill. There is no correlation whatsoever between the percentage of fumbles recovered by a team in one year and the percentage they recover in the next year. The odds of recovery are based solely on the type of play involved, not the teams or any of their players . . . Fumble recovery is a major reason why the general public overestimates or underestimates certain teams. Fumbles are huge, turning-point plays that dramatically impact wins and losses in the past, while fumble recovery percentage says absolutely nothing about a team’s chances of winning games in the future. With this in mind, Football Outsiders stats treat all fumbles as equal, penalizing them based on the likelihood of each type of fumble (run, pass, sack, etc.) being recovered by the defense.